An Ordinary Pen: What Does It Mean to Share Parenting? If you have ever talked to me about foster care or read any of my posts, you've probably heard me say that I'm so thankful for the ability to know Baby S's birth parent (yes, just one parent) and be able to work together with them. We call that "shared parenting". So what does shared parenting really mean? Shared parenting is going to look different for each set of foster and biological families. It's going to depend on the specifics of each case, the openness of each party to the idea of working together, and the safety of all involved. So keep in mind, what I am describing as shared parenting in our experience may look totally different than it does for someone else. Here's how we're approaching it this time, with this child. Shared parenting means that we don't think of ourselves as Baby S's only family. We recognize that he has a birth parent who is working hard to bring him home, who loves him, and who has an interest in how the big and little details of his life are playing out. When possible, we make decisions together. We ask birth parent's opinion and weigh it into our decisions. I make time in my schedule to get together with birth parent outside of normal visit hours for low-key play dates and non-stress visits so that parent and Baby S can form some fun, informal memories together. We are making an effort to spend some time with birth parent on holidays when we are in town, and we plan to throw Baby S his first birthday party together with people from both of his worlds in one place loving on him all at once. We have a journal that goes back and forth with Baby S each visit so that we're each caught up on how Baby S is doing daily and what his specific needs will be. We share milestones with each other and celebrate his achievements together. We even text back and forth, which has been so convenient and so great to be able to connect any time for the good of Baby S. We are so totally blessed to have that level of open communication, and birth parent has always been so respectful about having the ability to contact us. Shared parenting means we go to doctor's appointments together. It means Baby S gets to have a family history recorded in his medical records when I would have had to fill in each space with a big question mark. It means I know information about the first weeks of his life that I would not have known otherwise. It means his baby book has pictures and information starting from the very first day of his life. There are pictures of him with birth parent and pictures of him with my family. It means, as far as it depends on us, that he will always see us and birth parent as a team of people who are working together out of love for him and a desire to see his life work out for the best. Shared parenting is investing in a child together as a team. There are so many positives to shared parenting, and I 100% mean it when I say that I am so very, very thankful that we are blessed with a very positive relationship with Baby S's birth parent. But let me also acknowledge now that sharing parenting can be difficult, too. When my husband and I first moved to Rochester, we spent a lot of time with couples who had grown up in Rochester and still had family in the area. We heard a lot of stories about what it's like to have children in their grandparents' care a lot of the time. We heard so much gratitude for the help, love, and insight given by grandparents. But we also heard a lot of people recognizing the fact that it can be so hard to have Grandpa and Grandma involved in the big and little moments of daily life. So when I say it's hard, picture it something like what you might experience if you're trying to involve your own parents in raising up your children. Shared parenting means two groups of people who both have a very real claim on the child's life. Both groups of people have, hopefully, invested heavily in the child. They want what is best. But they don't always share the same opinions on what "best" means, or how to arrive at "best". Maybe they have different parenting styles. Maybe they differ on the best kinds of play, or what the child should be eating, or how the child's schedule should look. Maybe they have very different ideas of what is cute or stylish, for clothing or hair. You get the idea. Everyone has their own opinion, and they have reasons to believe they are right. Something that is not a big deal to one party might be a huge issue to the other. When you respect each other, you try to work together to arrive at something everyone is comfortable with. But ultimately, the final say can fall with just one party. So shared parenting can be tricky. While the child is in foster care, those daily decisions are made by the foster family. Sometimes, with big things, the birth family makes the final call. Of course, the definition of what is big or little isn't up to us. For example, according to our training handouts, foster parents can make the call on "little" decisions like who the child dates, but not "big" decisions like whether a child goes on a field trip or gets their ears pierced. I'm sure much of the final say depends on how each particular case worker interprets the situation. It's hard to make a decision that you know the other party won't like, that you think is for the good of the child. It's hard to make the little decisions, knowing that the big ones won't always fall to you. Two groups trying to parent together will never line up fully. Even two parents in the same household, who've had lots of practice working together and learning to love each other, can struggle. So shared parenting is sometimes just plain hard. There are moments of frustration and miscommunication. It can be a struggle. But it really is worth it. It means a long-term investment in a person who most likely could benefit from community and support. It means an investment in the child's future, if the child goes back to birth family, since they will decide how much contact - if any - the foster family will have with the child. It means the amazing ability to pray for someone and love on someone who will almost always mean the world to your little child, no matter what the past. 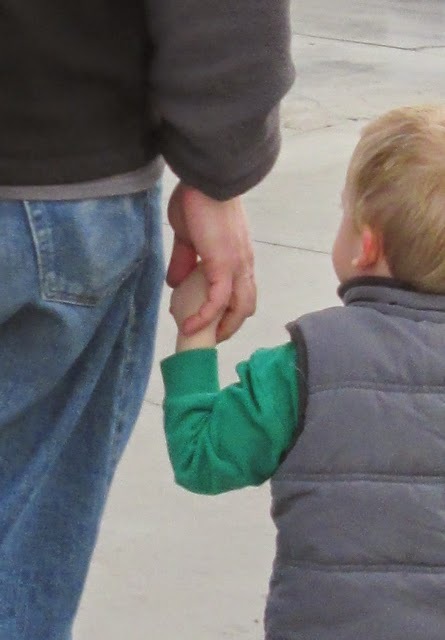 Helping to foster a loving, positive relationship between our foster son and his birth parent is one of the most amazing gifts we can give him, no matter what the future holds for his long-term placement.